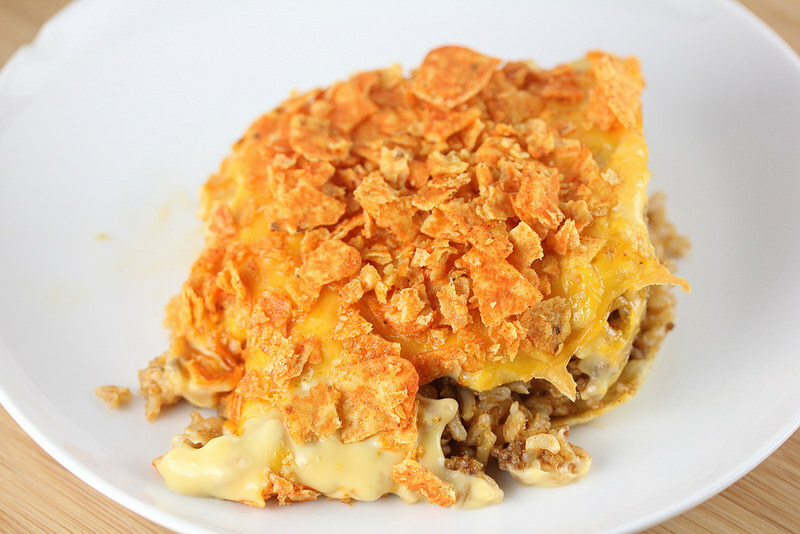 Doritos Taco Casserole is a delicious and indulgent dish. 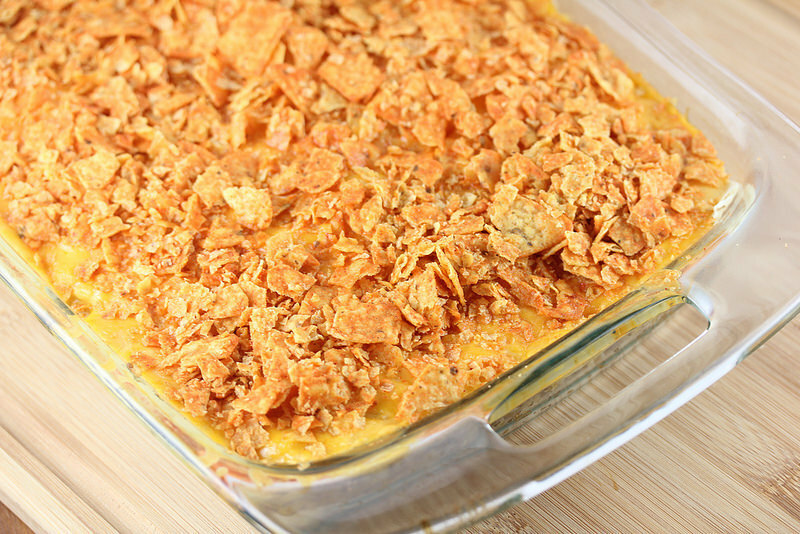 Nacho cheese adds flavor and moisture to the casserole and the crunchy Dorito topping tops it off perfectly. It can be made with or without beans, but the beans give it a great texture. 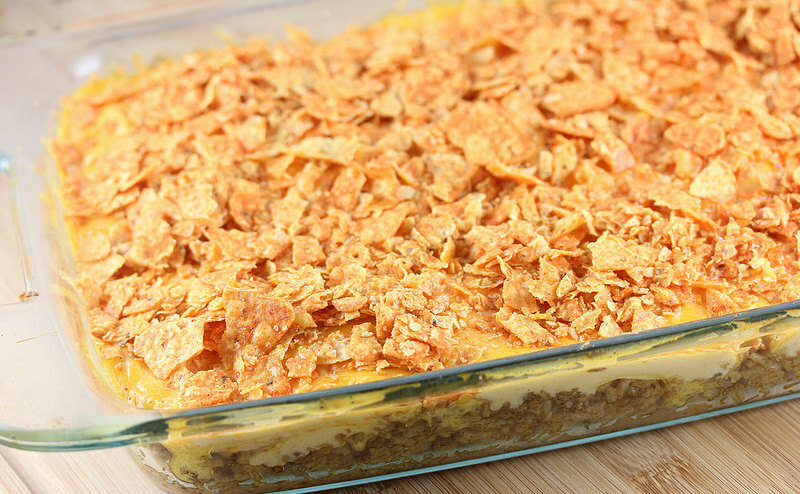 This casserole is heavy and filling and is sure to please and fill up your family. From Cully’s Kitchen to yours! Brown and cook ground beef with one packet of taco seasoning according to packet directions. Prepare rice. Once meat is cooked and rice is prepared, mix together and add the second packet of taco seasoning along with ½ cup of water. Cut tortillas in three pieces, so that the middle piece is relatively square. Grease a 2-quart casserole dish and cover the bottom of the dish with cut tortillas. Evenly spread refried beans on top of the tortillas, then add the taco meat and rice mixture on top. Drizzle about half of the nacho cheese on top of the meat and rice mixture and cover with another layer of cut tortillas. Spread the remaining nacho cheese on top of the tortilla layer and cover with the shredded cheddar cheese. Cook covered for 30 minutes, then uncover and add crushed Nacho Cheese Doritos. Cook for an additional 10 minutes, uncovered. Serve alone or with your favorite taco toppings—lettuce, tomato, sour cream, etc.